I am not a fan of sandwiches. However, Crab Melt is a different story. The first time I had a crab Melt was on a family road trip north to Oregon. We stopped by a coastal town called Brookings (southern coast of Oregon) to have lunch at a marina that has seafood eateries. The family ordered some Crab Melt’s, fish n chips, grilled oysters and smoked salmon dip (best SS dip!) from two different stores. Everything was so fresh and good, and the whole family falls in love with Crab Melt ever since. Since the trip I have been trying to creat the same flavor of the sandwich that we had in Oregon. After a couple of recipe fine tuning I’m finally happy with the result. Making Crab Melt is pretty much an easy assembly job. However, qualitied ingredient plays an important role to make it a good eat. Obviously you don’t want to waste Alaska King Crab meat on this sandwich, but please don’t use cheap crab or fake crab meat. Using some random cheese will throw the flavor off… etc. Please check out my note at the bottom for more details. Okay, let’s get started before the crab season is over! 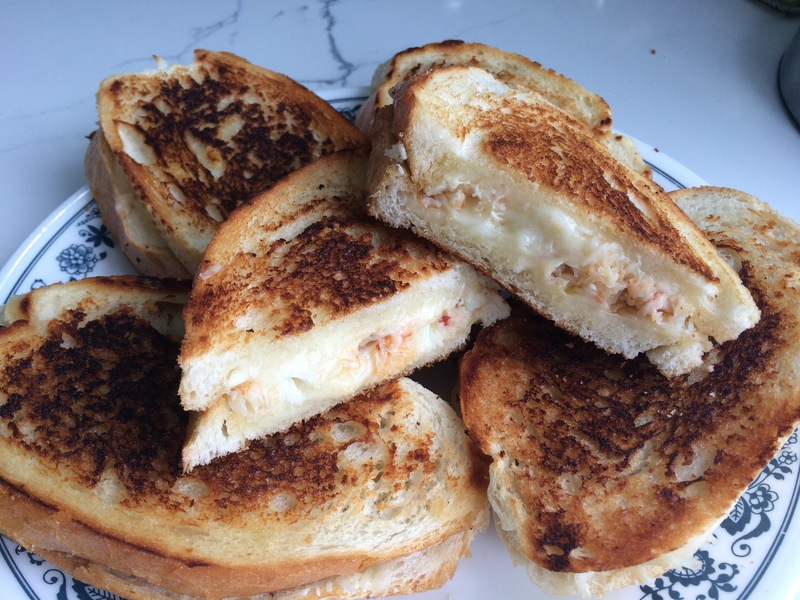 Crab Melt… from the buttery golden crunchy crust, to the generous amount of sweet crab meat and Asiago cheese in the filling, with just enough Mozarrella cheese to bind together. Mmmm… now this IS good eat! Spread butter on one side of the bread. Lightly brown the bread slices (buttered side face down) on a sauté pan/skillet/griddle. Transfer bread to tray/plates with buttered side face up. Combine Asiago cheese and Parmesan cheese. Sprinkle generous of cheese mixture on top of the bread, followed by Mozarrella cheese. Spoon generous amount of crab meat over Mozarrella cheese on 5 slices of the bread ONLY. Microwave all 10 slices about 1 minute until the cheese is slightly melted. Now find the bread partners– carefully flip over cheese slices over crab meat slices. Butter the top and bottom of the sandwiches, and grill on sauté pan/skillet/griddle until golden brown on both sides. Use a spatula to press down sandwiches to help bind the cheeses together. Serve fresh and hot. Crab meat: I like to use Dungeness crab meat but feel free to use any crab that is meaty and has a sweet taste. It’s best to use fresh crab (aka bought alive). Avoid using crab meat in a can or a tub as those are usually sourced in different country (different water, different taste…). Hand pick crab meta can take some time, but it can be done ahead of time and refrigerated (2-3 days) until ready to use. Asiago/Parmesan cheese: I find the cheese flavor goes very well with crab meat. Gruyere cheese is a good choice too. Because these cheeses taste salty so you don’t need to add salt to crab Melt. Avoid using Cheddar/Fontina/Gouda these sort of cheeses as they are too salty and will over power the delicated mild flavor of crab meat. Monterey Jack cheese: I use this cheese only to bind the sandwich breads together. Don’t use too much Monterey Jack cheese unless you want very cheesy sandwiches. I used to use Mozzarella but I switched to Monterey as it’s more flavorful, thus giving crab melt the buttery and richness taste. French bread: I prefer French bread but you can use any bread you like. Avoid breads that have big air pockets such Ciabatta and Pugliese (fillings will fall out), or baguette (unless you like the chewiness).